This site will now be updated regularly and will build on Rob's excellent work. You can now Contact Us with your questions, comments and suggestions. Jack Idriess was an extraordinary Australian. He was one of Australia's great authors. HE WAS NOT A VISIONARY, BUT A MAN OF IDEAS. NOT AN INTELLECTUAL, BUT A MAN OF INTELLIGENCE. HE WAS NOT SCHOOLED, BUT A MAN OF LEARNING. HE FOUGHT FOR AUSTRALIANS IN WAR AND IN PEACE. From his first attempt in 1927 to his final book published in 1969, Jack published 53 books. This is a serious achievement but if a dedicated collector set out to buy every edition of each of his books the total would be 350 and still counting. More than 35 years after his death, there are still Idriess books in print and therefore, readers are still buying them. Consider this record against the sales of today's more pampered authors for whom Jack laid the publishing groundwork. 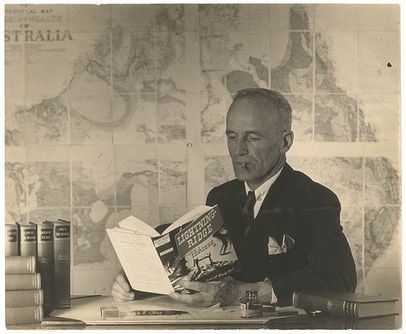 Jack sold more than three million books when his target audience (Australia's population) was less than seven million and his record must also be set in the context of the Great Depression. In the 1930's, when Australia was in the depths of depression, people still bought his books by the million. At the height of his popularity almost every Australian had bought or read an Idriess book. In ten of the twelve months of 1932 there was an Idriess book published, three new books, ten reprints and one second impression. There is no doubting the number of Jack's readers. More than three million Idriess books have been sold. As just two examples among many, in 1931 the first edition (2000 copies) of Prospecting for Gold sold in ten minutes and in 1932 Men of the Jungle was released in September and reprinted immediately. In three months 6000 copies had been sold. In 1975 the Public Lending Right gave authors a fee when a book was borrowed. More Idriess books were being borrowed than any Australian author. As recently as 2005, the Frankston (Victoria) library surveyed that community's favourite books. Included in the "Top One Hundred" was Jack's The Red Chief along with books by Asimov, Tolkien, Tolstoy, Dumas, Le Carre, Courtenay, Cussler and some other authors (like Patrick White) who have never come near Jack's sales and readership.